The resulting OTELO pseudo spectra is a set of fluxes corresponding to different wavelength coverages, where, each flux point is the result of the combination of (in general) 6 different TF images, although this number would vary between 1 and 12 TF images. Figure: Effect of the variation of wavelength coverage in OTELO pseudo-spectra. Top-Right: Variation of the redder wavelength in each OTELO pseudo spectra, mainly driven by the wavelength variation along the OSIRIS FOV (using pointing 1 as reference value). Bottom: Spectral coverage variation ( Δλ among reddest and bluest wavelengths) of each OTELO speudo spectra along the OSIRIS FOV (using pointing 1 as reference value), mainly driven by the dithering patterm. 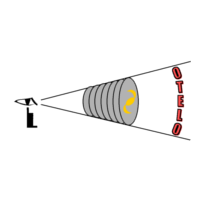 The net effect is that each OTELO pseudo spectra has a different wavelength coverage and resolution depending the relative position of the source with respect the FOV center of the reference image. The larger the relative distance, the bluer the redder flux point in the pseudo spectra (folowing a circular pattern), and the larger the wavelength coverage and number of fluxes points (following a rectangular pattern due to the dithering). 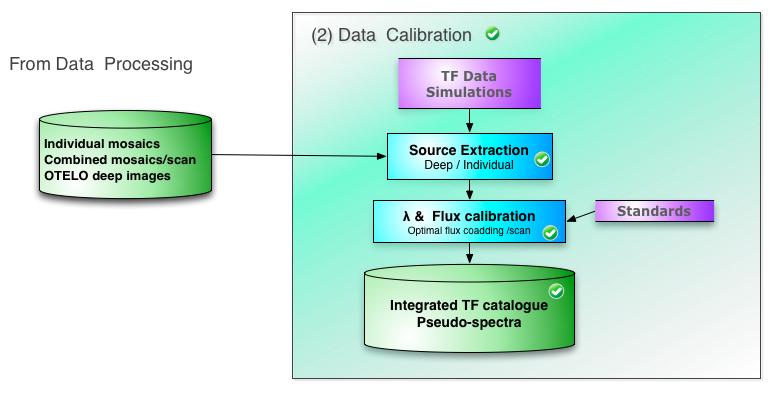 In addition, the effective response of each flux point, since a combination of different TF images, does not corresponds to the tranmision curve of any single TF but an hybrid combination of them wich depends of the relative position of the source with respect to the reference FOV center and the assumed dithering patterm. 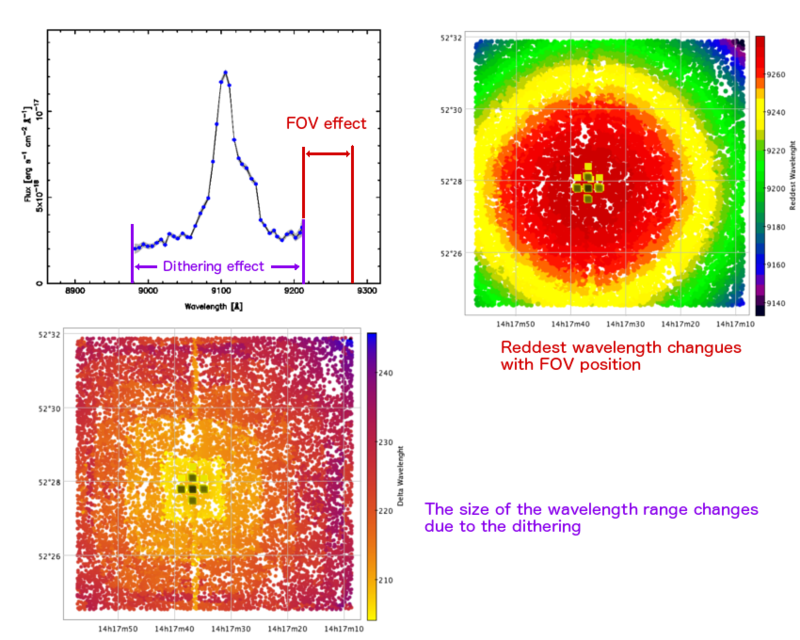 In particular, for lage distances to the FOV center, the pseudo spectra would contain more than 36 wavelngth points.